H2H captures and models complex data up to 10 times faster, enabling us to successfully complete projects in minimal time with little or no disruption at the project site. One surveyor can map a 3-story building in just 30 minutes to an accuracy level of +/- 2 inches, or map a 30,000 square foot warehouse in under an hour, recording more than 43,000 measurement points/second. The equipment is compact, lightweight and quick to deploy. No GPS Required! It’s adaptable to any GPS starved environment and in all industries, particularly in complex and enclosed spaces. To add contextual imagery to scanned data, the laser scanning devices are equipped with HD video cameras. 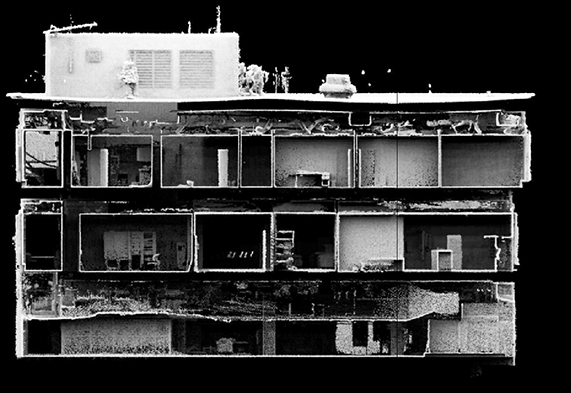 Built-in optical ﬂow technology allows accurate synchronization of acquired data and imagery, making it easy to extract specific building features.